DNA has been an important discovery for many reasons, a key one being its relationship to evolutionary theory. Evolutionists have been particularly excited with DNA advances because the basis of DNA is such that it can be utilised to document the history of evolution. By comparing DNA sequences of genes from one organism to another, we can learn an enormous amount about their relationships. In fact, this learning goes far beyond what we can learn simply from morphology. At the same time, scientists are still aware that the DNA document of history, so to speak, is one that has gaps and is somewhat fragmented. This means that there must be awareness regarding the genetic changes that occur, otherwise we can become biased regarding how evolution occurred. DNA has been used to study many aspects pertaining to the evolution of organisms. By investigating variation among species and the structure of different populations, scientists have learned a great deal about molecular evolution. Evolutionists look for specific patterns of DNA variation and then make logical inferences from the information. There is an enormous amount of variation within species, which does include humans. Your DNA will be different from another person's DNA. As such, two individuals cannot share the same DNA, although this does not hold true for identical twins. The result is that phenotype variation occurs. This type of variation refers to differences in the appearance and the behaviour of organisms within the same species. Variation can arise though mutations, which happen when DNA copying is faulty and there is a difference between parent and offspring genes. While a mutation can be 'fixed' by DNA repair systems, some may have negligible effects. Others, however, can impact large pieces of DNA and lead to changes within a species. Recombination occurs when two parent genes are essentially mixed up to create an offspring, a common occurrence in asexual reproduction. Although the parents typically are members of the same species, occasionally genes can be moved between less related organisms. This is more likely to occur in organisms such as bacteria. 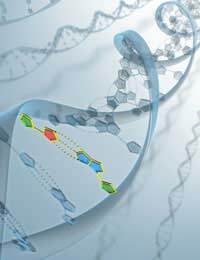 DNA actually has numerous roles, the most well-known being its ability to code for proteins. This coding, however, is quite different from DNA's function in terms of our genetic code. Our genes include those that are expressed; they also have special sequences that dictate precisely when and where DNA is transcribed into another molecule called RNA for the creation of proteins. Our genetic code is the system that allows an RNA strand to be translated into a necessary sequence of amino acids. Genomes for organisms hold a significant amount of evidence for evolution given that living species share the commonality of basic hereditary systems that use DNA or RNA to pass on genes from parent to offspring. By quantifying the similar aspects as well as the differences between and within species, scientists can assess the relationships between species. This tells us which species are closely or distantly related. This pattern then relays what is essentially Darwin's branched out tree for life. DNA supports genetic similarities and these similarities help researchers to understand effects from human genes through research on other species. For instance, there are genes governing DNA repair systems in bacteria, flies and rodents, which have been found to impact cancers in humans. Evolution is certainly an area that generates debate although the scientific community at large is confident in the theory of evolution and it is mandated in the United Kingdom curriculum as well as most other places in the world. The discovery of DNA has supported evolutionary theory and our continued understanding of this molecule can help scientists to make predictions about the direction of evolution in the future. 150 years later and there is NO mechansim for evolution. Natural Selection is NOT a mechanism. They cannot locate a SINGLE mechanism that CAUSES, CONTROLS, MAINTAIN and FINALIZES an evolution event. The simplest solution is often the correct one. I submit the reason a mechanism cannot be found is because a mechanism does not exist. According to the latest large study by Thayer, DNAamongst the largest survey ever done is showing a complete LACK of diversity. Your article is misleading and untrue given information available at the time of this article. DNA has shown that transitory forms don't really exist as once assumed. Worst of all, animal life seems to come from an exact point in time for all of it. In other words, all present-day species seem to exist from a single point thousands of years ago, not Millions. Thayer was producing his study in support of evolution. It ended up debunking much of it. How do these amino acids form into a big new cell: Adanine, Guanine, Thymine, and Cytosine. What i find most amazing about DNA apart from the obvious implications it has on the evolutionary process and our ability to use it as a tool to trace our past as well as our relationship to other living organisms,is what drives it?The creationist can have a field day with this questions,think about it RNA which later becomes DNA,is the prerequisite for evolution and cellular reproduction. Amazingly it is a tightly regulated, self policing system with what seems to be a single goal ,which is to continue to exist as long as it can and to replicate itself as much as is possible.It almost sounds biblical.What dictates DNA activity is it a combination of laws of physics and chemistry or something more?Infact i personally think that DNA is the first sign of DNA after all is evolution not a function of DNA and evolution a function of adaptation, and adaptation a function of intelligence. The earths existence is a result of a series of coincidences that made its condition optimal for the sustenance of life,but the evolution of life is no coincidence. Anyone who has spent enough time with bacteria whic fortunately are single cellular organisms where evolution doesn't take eons as it does for multi cellular organism will concur. Evolution is a goal directed process to continue it's own existence, and the mechanisms used to attain this are nothing short of ingenious. If we continue studying DNA I have no doubt we're going to meet GOD. How did an inanimate object with no DNA evolve into a living single cell with DNA?